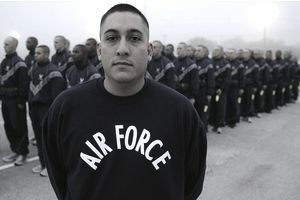 To graduate from Air Force Basic Military Training (AFBMT), you must pass a physical fitness test. The test consists of a timed run, push-ups, and sit-ups. Before arriving at basic training, you'll want to prepare to meet the minimum physical fitness arrival standards. Keep in mind that these standards are for AFBMT only. They are not the fitness standards you will be required to maintain after basic. After basic training, the Air Force has a different fitness test airmen have to pass at least once a year. In addition to the minimum basic training fitness standards, which the Air Force calls the Liberator standard, there are two award-level standards. In order to be considered for possible selection as a basic training honor graduate, you must meet the Thunderbolt standard. Those who can meet the highest standard, the Warhawk standard, receive a special T-shirt, a recognition certificate, and receive an extra town pass on graduation weekend (that means they get to go off-base on the Sunday following graduation, as well as the normal Friday afternoon and Saturday). Those who fail the final PT evaluation, but were really close, are usually given one more opportunity to pass it the next day. Failure almost always means getting "recycled" for a couple of weeks to an earlier flight, thereby giving the recruit more time to get into shape. First, get on a plan. If you arrive at basic training in poor physical condition, you will likely not be able to meet the standard and may suffer one of or more overuse injuries, such as shin splints, tendinitis, or stress fractures. If hurt badly enough, a recruit will either be rolled to rehab the injury or sent home. Start getting active early. Military training is a full-time job and basic training consists of long days and nights for several weeks. Getting into the habit of working out in the morning, going to school or work during the day, then doing something in the evening like another workout, sport or study are ways to prepare the body and mind for long days of work. There is no 30-minute gym routine that prepares you for the full day of military training. You need to learn how to put in the time. If you are overweight, even just borderline, or near the maximum body fat standards, get started even sooner as you will likely not be able to depart for basic training. Start with non-impact aerobic activities then progress into running and calisthenics to properly prepare for the rigors of training and the fitness test.